Is Academe Now Privileging Click-bait Over Rigor? Portia Roelofs is an LSE fellow in the Department of International Development at the London School of Economics, where she obtained her doctorate. She works on the politics of development with a focus on Southwest Nigeria. Her website is www.portiaroelofs.com. Max Gallien is a PhD candidate in the Department of International Development at the London School of Economics. He works on the political economy of North Africa with a focus on informal economies. Earlier this month, development studies journal Third World Quarterly published an article that, by many common metrics used in academia today, will be the most successful in its 38-year history. The paper has, in a few days, already achieved a higher Altmetric Attention Score than any other TWQ paper. By the rules of modern academia, this is a triumph. The problem is, the paper is not. This article by Portia Roelofs and Max Gallien originally appeared on the LSE Impact of Social Sciences blog as <href=”http://blogs.lse.ac.uk/impactofsocialsciences/2017/09/19/clickbait-and-impact-how-academia-has-been-hacked/”>“Clickbait and impact: how academia has been hacked” and is reposted under the Creative Commons license (CC BY 3.0). Of course, none of this is accidental. It is a well-planned provocation, an argument that feeds off the criticism it is designed to create, and references it as evidence of the prevailing “orthodoxy.” If this sounds familiar, this is exactly the same strategy with which the alt-right movement has hacked its way into public debates. The article even replicates its trademark victimhood and brazen rewriting of history by claiming that colonialism has had a “bad name” for the last hundred years, and thereby backdating what the author perceives to be a politically correct obsession to a time when colonialism was still official government policy in many states. Surely, these views are not entirely new. That they exist is not shocking. We are slowly getting used to the alt-right. However, that these ideas and strategies, distilled into academic writing, not only get published but immediately jump to the top of some of the key metrics we use to identify success, influence, and “impact” in academia – this is chilling. Because this means not only that academia can be hacked, but that it already has been. This article represents the culmination of broader trends in academia: from marketization, to impact, to the promotion of artificially adversarial debate. From the late 1990s, universities have been under pressure to operate more like businesses. Rather than existing in their own comfy bubble, politicians demanded that universities face the bracing winds of the market and earn their keep. Students became consumers, big companies increasingly set the agenda for publicly funded research, and academics were to be subject to the same accountability and incentives as, say, a call-center worker. Academics have to publish. In order to rank articles against each other, the world of academia had to create a universal way of quantifying how good an article is: hence the citation index. Indexing platforms like Scopus, Web of Science and Google Scholar record how many other articles or books cite your article. The idea is that if a paper is good, it is worth talking about. The only thing is, citation rankings count positive and negative references equally. But this style of quantifying how good an article is pales in comparison to what has been done under the “impact agenda.” Initially spurred by the desire for professors to reach out and engage with the world outside the “ivory tower,” impact came to be measured by blogs, page views, download stats, and tweets. Academia is replicating the structure of the mass media. Academic articles are now evaluated according to essentially the same metrics as Buzzfeed posts and Instagram selfies. In fact, the impact factor is an especially blunt example of online metrics: Reddit, Youtube, and Imgur at least allow users to up-vote or down-vote posts. The result is to dilute the idea of impact to simply publicity. And as we all know, all publicity is good publicity. (It is worth noting that Gilley lists his “scholarly impact metrics” on his CV above any of his publications.) And it’s deadly serious: how many likes your article gets is not simply a matter of vanity but is ingrained into the system of academic rewards and respects; whether when applying for promotions, jobs, or research funding. If your job prospects depend on clicks, you’d be stupid not to write clickbait. But it’s not just an obsession with rankings and hits that leads academics to write extreme and reductive articles, and academic journals to publish them. 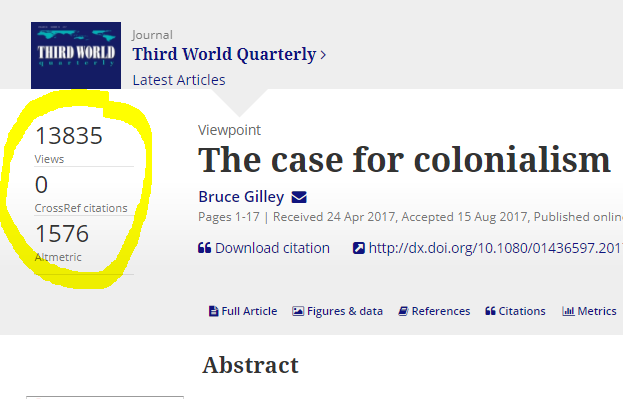 The Gilley article reflects another, equally pernicious trend in academia. Increasingly academic debates are reduced to an adversarial “for and against.” This too mirrors movements in the news media. In search of a myopic idea of “balanced debate,” browbeaten news shows bow to the idea that the truth is always “somewhere in the middle” of two extreme opposing views. This renders actual progress in debates impossible. It creates false dissent on issues which are overwhelmingly sites of consensus, like climate change, and it stops debates from developing beyond their starting premise. When academia is thus framed as a confrontation, it favours confrontational people. This has gendered and racialised effects. We live in a world where young boys are conditioned to be louder and more outspoken than girls; where “stereotype threat” means that black people have to be on guard against being seen to confirm stereotypes that they are aggressive. In universities, this translates into departments which are perhaps gender-balanced in number, but where men’s work is systematically rewarded at a higher rate, and black and minority ethnic academics are almost invisible. The sort of sensational articles that get hits – like Gilley’s – are those for which white men are lauded, while everyone else is told to get on and do some proper work. Sometimes, a system reaches a point when its output is so surprising, so concerning, so against its function and mission, that a fundamental rethinking of the system itself becomes imperative, that we need to say “OK, let’s stop everything and figure out where we went wrong.” Academia serves truth and social justice best when it acts as a counterweight to the hysteria of the 24-hour news cycle. The success of articles like Gilley’s show that, unless something changes, good research may go the way of good journalism: all that is solid dissolves into clickbait. This entry was posted in Higher Education Reform, Impact and tagged Altmetrics, Bruce Gilley, Clickbait, Impact Agenda, LSE Impact. Bookmark the permalink. Post a comment or leave a trackback: Trackback URL.